Sandra Morgan and Robyn Hofmeyr travelled to North Stradbroke Island on the 28th of September as part of a Museum exchange with Elizabeth Gondwe at the North Stradbroke Island Historical Museum (NSIHM). Elizabeth had invited Sandra and Robyn to talk at their Museum’s AGM on the 29th of September. Sandra had never been to Stradbroke Island – despite having spent most of her life in South East Queensland and having relatives on the Island. There is a strong historical link between Cherbourg and Stradbroke as many Aborigines were moved between the two places during the years of the Aboriginal Protection Act. The Museum on Stradbroke seeks to accommodate and reflect the diversity of the Island. The Pioneer room, the Aboriginal room as well as the current Whale exhibition all tell different stories of life on the Island. We were impressed with their storage facilities, cataloging, archiving system and database. For various reasons, this one aspect of the Ration Shed Museum in Cherbourg is still way behind and needs a lot more effort and attention. Elizabeth kindly offered to assist us with this. We were surprised (and envious!) to learn that the Stradbroke Museum receives operational funding from the local Redland Council. At the Ration Shed Museum we receive no core government support for running costs and rely on visitors, tourists and various government grants to keep us going. Balancing our books is a constant struggle – as it is with so many of the museums in our country. Seeing the Stradbroke Museum gave us cause for hope. On the day of the AGM, we were overjoyed when at the end of our talk the members of the Museum suggested that they hire a bus and visit the Ration Shed Museum in Cherbourg. Councillor Craig Ogilvie and Councillor Paul Bishop who both attended the AGM are clearly big supporters and champions of the North Stradbroke Island Museum. The Ration Shed Museum look forward to building an on-going relationship with the North Stradbroke Island Historical Museum and the communities it reflects. 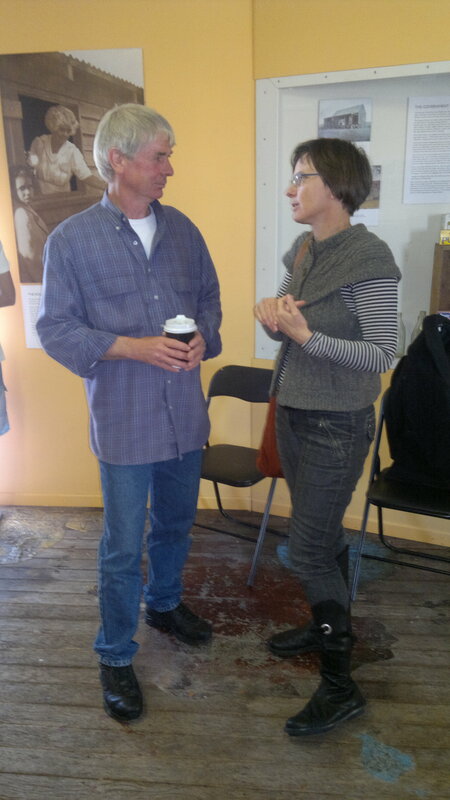 ROBYN HOFMEYR is a Coordinator/Filmmaker/Educator at the Ration Shed Museum, Cherbourg. She is undertaking a Co-Mentorship | Exchange with Elisabeth Gondwe, Curator/Ethnographer at the North Stradbroke Island Historical Museum. See M&GSQ’s website, http://www.magsq.com.au for more information about the Mentorship, Exchange and Fellowship Program. Jo Besley, Senior Curator Social History, Queensland Museum, and Churchill Fellow 2009 was named one of the Friends of The Ration Shed at the NAIDOC celebrations in Cherbourg in recognition for her pro-bono work. ‘to give our community a strong clear picture of their history and a sense of pride in that history, to engage and to educate the people of Queensland and Australia about what life was like living under the Aboriginal Protection Act and to offer a positive vision of the future’. Day one of the NAIDOC events at the Cherbourg Ration Shed Museum was a wonderful celebration on a beautiful sunny day, with Cherbourg Historical Pecinct looking great, lots of positive community energy, the new Ration Shed high school mentors in attendance and plenty of good will from invited guests.